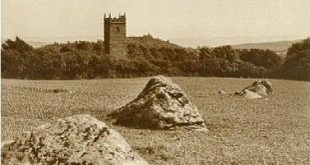 Hidden in the various ancient churches of Dartmoor are numerous ‘treasures’ of very description. Many are easily overlooked and many reflect a story from the past. Albeit it a grave, an epitaph, some architectural feature or a simple sign they are worth seeking out. 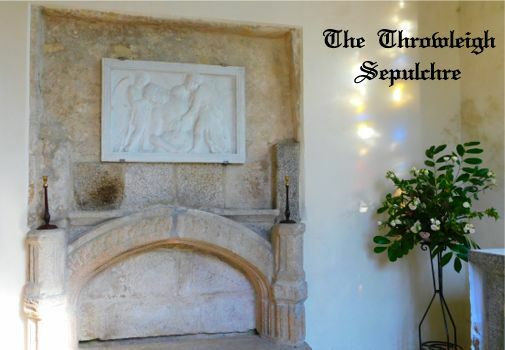 One rarer examples is the Easter Sepulchre which can be found in the Church of St. Mary the Virgin at Throwleigh. Easter Sepulchres were a vital part of the Easter ritual which lasted from Good Friday to Easter Sunday. At the conclusion of Good Friday’s Mass the devoted worshippers would crawl on their knees and kiss the cross, this was known as ‘Creeping to the Cross’. The priest would then place both the cross and the consecrated host in the sepulchre. Once these were safely interred a curtain would drawn across it and candles lit. The ritual then dictated that the candles must remain lit until Easter Sunday and it was normal practice that the Clerk or Sexton kept vigil to ensure this happened. On Easter Sunday morning both the cross and the host would be removed by the priest and placed on the altar. This whole ritual represented the body of Christ being placed in his tomb and then his resurrection. Evidence of this rite can be found in a Rationale written in the fifteen century where the practice of ‘creeping to the cross’ is noted along with the whole ceremony as noted above. Following the Reformation it was decreed that this Easter ritual along with its sepulchre was an act of idolatry and by 1558 was no longer practiced. For some reason Throwleigh’s Easter Sepulchre was moved from the north wall and repositioned in the south wall? 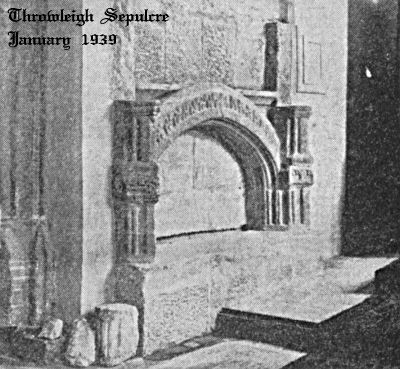 At some point in 1938 Mr. A. W. Everett of Posloe Priory discovered a recess which he deemed to have held the sepulchre. In this recess was found a row of four nail holes which possibly was where a wooden panel of the Resurrection hung. Following this discovery the reverend H. R. Drew Drew then had it relocated back to the north wall. Today, as can be seen above, there is a panel showing a modern copy of ‘The Dead Christ tended by angels’. Whereas in the photograph below from 1939 the panel is missing.